St Margaret’s Church has a ring of five bells. One of these bells is a mediaeval bell from the fifteenth century. Two of them date from the seventeenth century and the remaining two were recast at the time that the bells were re-hung early in the twentieth century. The tenor bell (the heaviest) is A flat and weighs 10.25 cwt. Little is known about the bells or the ringing in the early days of Lyng church. The will of John Berny, written in 1492, bequeathed money towards new bells. The present fourth bell dates from about this time. In 1618 Solomon Leech left 1s 4d annually for the provision of bell ropes. The treble and third bells are dated three years after this, in 1621. White’s Directory of 1884, in its entry on Lyng, states”The church (St Michael's) has a tower and six bells” It is interesting to note that the church was dedicated to to St Michael then and it might be thought that there were five bells for full circle ringing and a sanctus bell for chiming. In 1902 the bells were re-hung on a steel frame on plain bearings by Day and Co of Eye. This work included the re-casting of the second bell (originally a John Draper bell from 1618) and the fifth, probably because they were cracked. The work was part of a major re-building programme instigated by the Rector at that time, the Rev. Henry Rogers and was paid for by his father, Henry Rogers Snr of Coltishall Hall. The other work included re-roofing the nave, re-building the Chancel on its original footings and rebuilding the south wall. Ringing continued through the 1920’s and 1930’s but would have ceased (as everywhere) in 1940 when, after the fall of France, church bell ringing became the official warning of invasion for three years. Names of the ringers active from that time are recorded in the belfry visitors’ book. 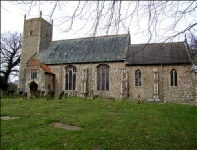 Call change ringing and method ringing have long been practised at Lyng. Only two full peals have been rung there, in 1958 (Bob Doubles) and in 1976 (six extents each of St Simons, St Martins, Plain Bob, St Nicholas, Winchendon Place, Rev. Canterbury and Grandsire.) Both peals were by visiting bands. The bells were silent for about 16 years until 1983 when a new band was recruited and taught to ring under the captaincy of the late Leslie Thomas. With new ropes regular ringing restarted until 1989 when disaster struck! Whilst the bells were being rung for Ascension Day Service, a large piece of masonry fell from the west wall into the vestry. Ringing was stopped and on inspection, in a test ring, the whole bell frame was found to be moving in the tower. The oak beams on which the frame was seated had suffered insect attack and rot and were then loose in the tower walls. At this time the vestry was moved into the tower base and a ringing floor was incorporated on the vestry roof. Rolled steel joists were fixed into the tower beneath the decaying wooden beams, reinforcing the structure. This was financed by a local fund-raising campaign. Ringing resumed for the Ascension Day service two years later and has continued ever since. Several of the original ‘recruits’ are still active in the band. Since 1984 three quarter peals have been rung, two of which were local efforts. Due to structural faults in the tower, bell ringing was suspended in 2013 until remedial action was taken. This was completed in 2015 with local and English Heritage financial support. The bells can be heard ringing out on practice nights, on Fridays throughout the year. The friendly band, which has a reputation for teaching and bringing on players, welcomes visiting ringers and especially anyone who would like to take up this time-honoured pastime and join the band.